With our local tour guide we will start a short city tour crossing the historical center to see Piazza del Plebiscito, the Royal Palace, the Basilica of San Francesco Di Paola, the San Carlo Opera House, the Gallery of Umberto I and the imposing Maschio Angioino. 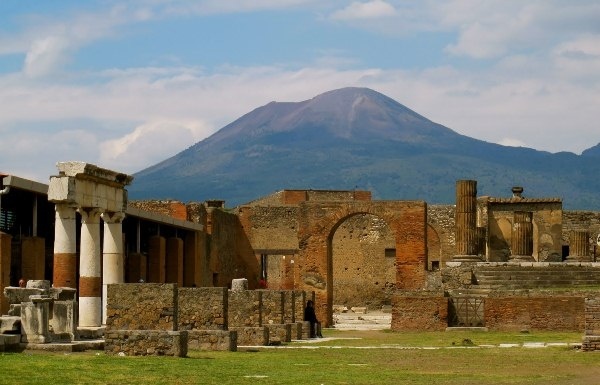 Upon leaving the city, we cross the fertile valley of Mount Vesuvius, passing the villages of Ercolano, Torre del Greco and Torre Anunziata before finally arriving at Pompeii where we will first have a stop for lunch before visiting the excavations. After lunch a local guide will take us on an approx 2 hour archeological journey on foot to see some of what have been discovered in approx. 1900 years since Pompeii was covered by ashes during the eruption of Vesuvius in the year 79 AD. Through the remains and ruins of this ancient city, we can picture the everyday life of the Imperial Age and imagine the panic felt by the people in those last few minutes before the city was so disastrously buried. At the end of the visit to Pompeii we will then return to Naples - Beverello where the tour ends. No return to hotel included. During this excursion we will visit a Coral and Cameo factory where we will have the opportunity to inspect and purchase items of this ancient craft dating back to Greek times. N.B. We suggest that you wear comfortable clothes and shoes for this excursion, and to wear sunglasses and sun hats in the summer months.